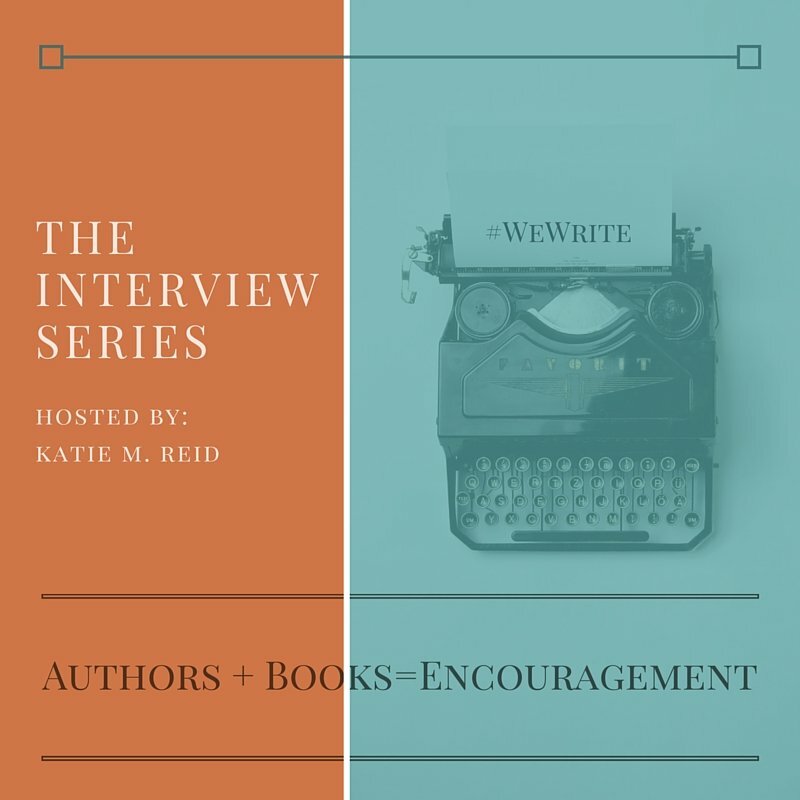 Welcome back to the Author Interview series! *Referral links are below. If you click through and take action, I may receive a commission, at no additional cost to you. It is my pleasure to welcome Kim Hyland as our guest. She is wise, grounded, and kind. 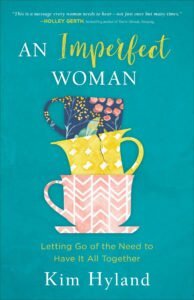 Her book, An Imperfect Woman: Letting Go of the Need to Have It All Together is for every woman who gives it everything she’s got…and still feels shame when one little thing goes wrong. Let’s learn together from this smart and humble woman. 1. Can you tell us how perfectionism has impacted your work, relationships, or faith? Perfectionism is a thief, and it’s not at all discriminatory. It has an insatiable appetite, but it’s not a picky eater. It has consumed hours and even days and years of productivity, telling me the circumstances weren’t “good enough” to move forward in my responsibilities and dreams. It has robbed me of contentment in marriage, as a mother, and as a friend, always insisting that there was something crucial lacking in my relationships. It has even tried to steal my joy and my faith, making my relationship with God about my performance, which of course could never reach the standard of a perfect God. 2. What is one of your go-to verses for combating perfectionism? My absolute favorite verse for combatting perfectionism is 2 Corinthians 4:7: “But we have this treasure in jars of clay, to show that the surpassing power belongs to God and not us.” I love it because it reveals God’s design for us! He intentionally made us weak vessels of clay and entrusted us with the treasure of the Gospel, so that we and everyone else would know that HE is the powerful, capable, and glorious One. When I remember this and live in sync with my design, I see my weakness and struggles as opportunities to rely more on Him. It shuts perfectionism right up. 3. We each have an innate desire for perfection. Can you shed light on why you think that is? 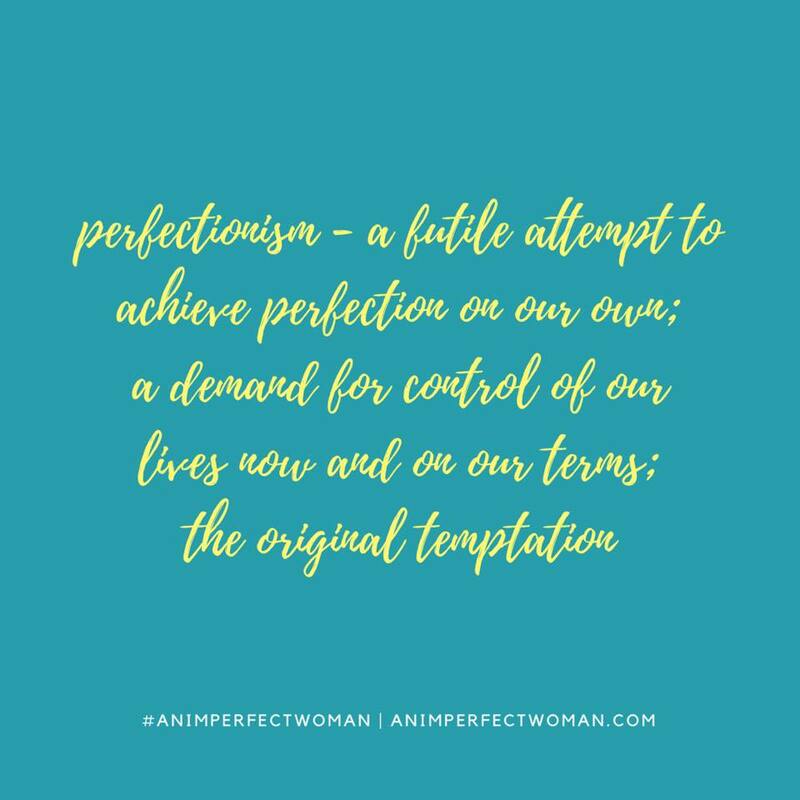 We can’t kick our desire for perfection, because God is perfect, He created us in His image, and He made us for a perfect and sinless place. Adam and Eve lived in Eden in perfect relationship with God. We see and feel the weight of this world’s imperfection because of sin. As believers, it’s a tangible reminder that this isn’t home. We find our desire for perfection met in our relationship with Him where a perfect God meets our imperfect lives. 4. Letting go of the need to have it all together can be challenging! What is one practical way you have found to do this? I’m definitely still learning. And just when I think I’ve mastered the lesson, God seems to take it deeper. I think learning to let go of our attempts to satisfy our souls with things in this life is really a lifelong lesson. 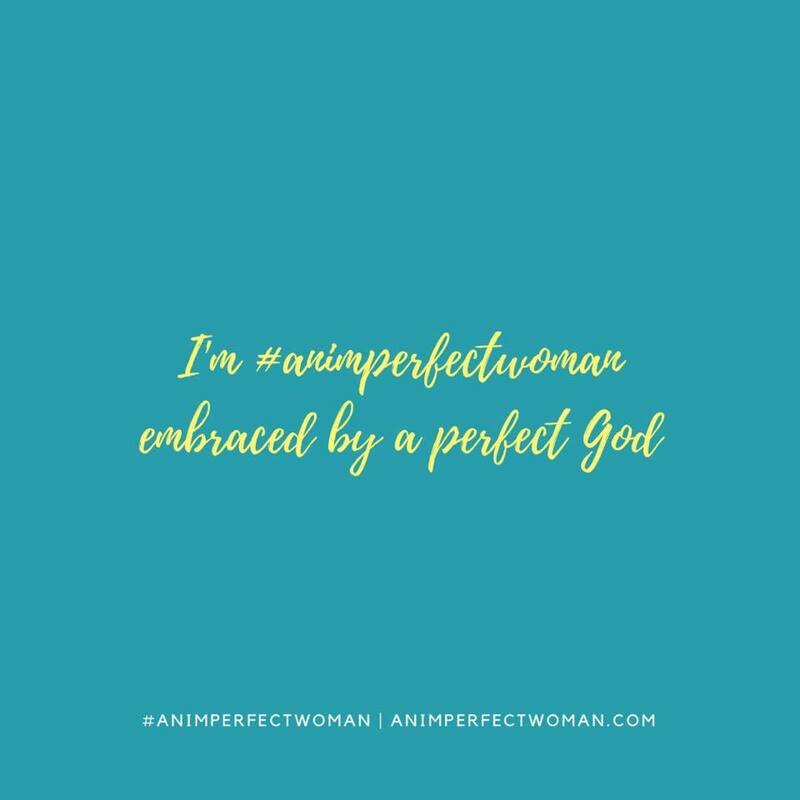 Some practical things I’ve done are to intentionally turn the focus of my mind and heart from my imperfection to God’s perfection. Rather than letting my “issues” occupy so much of my headspace and emotion, I pour out my heart “Psalmist-style” and then focus on what is true about Him. Reading scripture out loud, posting it around my house, singing praise music, and talking about His goodness all help me keep my focus on Him. 5. Will you offer a prayer for the woman who struggles to be kind to herself in this process of letting go? Absolutely! God, thank you for your perfection and its reflection in our deep desire for what is right and true. Forgive us when we turn to our own futile efforts to perfect ourselves and deny what you have done through the perfecting blood of your Son. Help us to remember that, while we live in the in-between of our salvation and full redemption, your grace is sufficient to guide our lives and comfort our hearts when we long for home. God, would you be louder than the voices that try to define us and tell us we don’t measure up? Let your truth and love tell us who we are and bring contentment and rest to our hearts and minds. In Jesus’ name, amen. 6. What do you hope the readers gains from reading your book? Freedom. I hope and pray that as she reads, the Holy Spirit breaks chains from off her heart and mind and gives her increasingly clear vision of the beautiful, unique, and precious woman God has created her to be. And I hope she discovers her desperate need for a moment by moment, close walk with her loving Father. 7. What was one of the most difficult aspects of writing this book? Perfectionism! In my book I define it as a futile attempt to achieve perfection on our own; a demand for control of our lives now and on our terms; the original temptation. At every stage of writing, and even now as it releases, my own temptation to rely on myself (or to despair because myself is so insufficient) has nipped at my heels and even pushed me around. Over and over, I have to come back to the truths God revealed to me in my book. 8. What did your writing process look like? This message has been on my heart for years. I’ve shared it with Sunday school classes, mom groups, and retreats. I always knew I wanted to write it but was pretty overwhelmed and unsure where to start. As I started the process of learning and writing my proposal, I believed God was telling me to keep being faithful to share the message wherever I could. It was at a retreat that the woman who ended up being my editor heard me speak and asked to see a proposal! It took me awhile to pull it together. My perfectionism definitely got in the way. I hired a writing coach, and her encouragement and support were invaluable! I submitted my proposal and received an offer. My manuscript was completed in seven months. It was wonderful to have to write, something I have always loved, but it was hard work too. I learned to rely on God in a new way. 9. I’m a grace-lover! Please unpack grace for us try-hard gals. I used to think I understood grace. That was a sure sign I didn’t. Who can understand grace? It’s always more than we expect it to be. The closest thing to understanding it is being a parent (when I’m at my best). I love my children no matter what, simply because they’re my children. They might let me down, anger me, and even bring me to knees in tears, but I will always be in their corner no matter what. I think that helps me understand just a little better how God sees me as His daughter. He’s proud of me. I’m precious to Him. In His eyes, I’m perfect. Thank you, Kim. We sure appreciate you being here and pointing us to the Perfect One who is able to set us free. 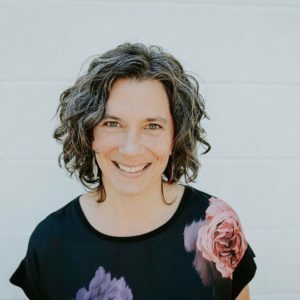 Kim Hyland is a writer, a speaker, and the founder and host of Winsome, an annual retreat for women that celebrates authenticity, diversity, and truth. She also speaks at national retreats and conferences, where she encourages women by sharing her imperfect path and God’s perfect plans. Originally from the DC metro area, she now lives with her family on a mountain overlooking the Shenandoah Valley in Virginia. Connect with Kim at WinsomeLiving.com. Learn more (or purchase) Kim’s book, An Imperfect Woman. I cannot wait to read Kim’s book! I love her comments on the writing process … definitely teaches you to rely on God through every step! Hugs to you both! Yes, Lauren! It’s a beautiful book as I know yours will be too!